After teaching one of my Christmas Card classes tonite (I'm writing this post late and setting scheduling it to post for me), I sat down to create this weeks Bloggers Challenge - not having a TJ Blogstravganza post ready, I wanted to combine both into one post. I sat for awhile, looking at the color combo (Close to Cocoa, Tangerine Tango, Kiwi Kiss, Bashful Blue, with white or vanilla)- thinking aloud...I bet the Bloggers Challenge Players are probably wondering "what in the heck was she thinking here". The more I looked at the colors, the more I really liked them - then I checked my mail - and I think they did too - as I saw quite of few of them posted - be sure to check them out, they're a talented bunch! Not your typical colors for a Holiday Card, but I like them! If the sketch looks familiar - it's the same one I used in yesterday's post from SC205. If you'd like to play along, just leave a link to your post here, or if uploading to SCS use keyword BC76, so I can find your creation! Tech - Triple Dimension for a past issue of TJNL. This is super cute, Lisa! Love the stamps you chose - and yes, this color combo rocked! Thanks, Mom! I love your card and the "bow" on it is perfect! LOVE the snowflakes in these colors, Lisa! This is sooo pretty! TFS! Love the colors too and wish I had participated this week, maybe I'll work on it this next week. 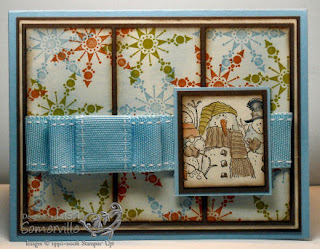 Very cute card, love the ribbon on it! It was a fun color challenge, especially with the Frosty Day DSP having those colors! Love the snowflakes done in the non-traditional colors...great job! Oh this is so flippin' cute! I always think I have to use the entire stretch of this image, but look what you've done...how very clever. Fantastic job. How cute! - Love the snowflakes you made in the colors and the way you did your bow is wonderful. I thought for sure you'd use the Frosty DP as that's where I figured you got the colors from but you didn't and yet your card is perfect. Fab job, Lisa!! I flunked out on this challenge....I couldn't wrap my mind around these colors! LOL! Gorgeous! Those snowflakes look so good together in those colors! This is such a happy card! I love that you only used a peice of the whole image. Great card, Lisa! I love your double loop bow too! The stamps you chose work perfectly with this color combination. Very nice job! Great card, Lisa! Love the combination of the two different sets here. This is a fabulous layout! I love the depth and richness that your bow adds! Awesome!! Wow, this is awesome. I love everything about this card, the ribbon especially. Very cute, Lisa. Great background with the different color snowflakes.